Scheduling dictates your flow of work. Keep the current going strong with better and smarter scheduling. Your pool and spa service business will see the difference Smart Service scheduling software makes in every facet of your operations. From dispatching to accounting (and everything in between), business operations are simply better when scheduling works together with QuickBooks! Most of your business is operated outside of the office (and you have tons of sparkling clean pools to prove it). Therefore, your pool and spa service management software should operate outside of the office as well. The Smart Service mobile app allows your technicians to have all the benefits of the office in the palm of their hands. Your dispatchers can schedule new jobs that appear on your technicians’ phones immediately. They can also access job notes, add pictures to customer histories, fill out forms, receive payments, and more! You already use QuickBooks for all of your accounting needs and have loads of data stored on customers and equipment. Why not add scheduling to it? Smart Service scheduling software for pool and spa service businesses integrates with QuickBooks so that you can start using it as soon as you get it. Don’t worry! No hours will be spent copying over information because it’s already there. And there’s more! When you schedule a job, it creates a work order that can then become a ready-to-bill invoice after the job gets completed. Smart Service-QuickBooks integration is exactly what your pool and spa service business needs in a scheduling software. 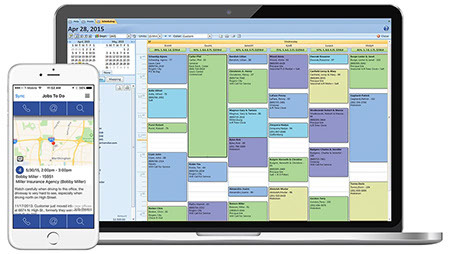 The best scheduling software for your pool and spa service business should seamlessly integrate with all your other business operations. Smart Service will save your business time and money while allowing you to run it more efficiently. So throw the paper and pens out the window! A whole new world awaits. Request a demo of Smart Service now! Check out these business tips and tricks so you can swim laps around your competitors!